In yet another specialty pharma deal, privately held Alvogen Pharma US, Inc. of Pine Brook, New Jersey, acquired South Korea-based Dream Pharma for $187 million in cash. On completion, the new entity will become one of the largest generic pharmaceutical companies in South Korea. Alvogen’s stated ambition is to become one of the top five regional players in the Asia-Pac market. Dream has a portfolio of more than 100 products, and currently has a 35% share in the Korea obesity products market. The transaction is expected to close in the fourth quarter. Health care companies and providers have long been targets for private equity firms. Since 2008, 267 acquisitions have been conducted by private equity groups, which represents just 4% of the combined total of 6,766 deals recorded and closed in that timeframe. PE deal-making activity has picked up annually since 2011, and will likely surpass 2013’s level of 55 transactions. There’s still plenty of time till 2015. IPC The Hospitalist Company (NASDAQ: IPCM), which acquires in hospital medicine and post-acute physician group practices, has acquired GeriCare, LLC, a post-acute medical group practice with operations throughout Connecticut. GeriCare estimates its patient encounters are approximately 42,500 on an annualized basis. Terms were not disclosed. Salt Lake City, Utah-based Tolero Pharmaceuticals, Inc., a clinical-stage biopharma that develops treatments for oncology and hematologic diseases, closed a $14.2 million Series B financing, led by Fred Alger Management Inc., and other institutional and individual investors. Proceeds will go toward the further development and commercialization of its lead program, alvocidib, in development for the treatment of acute myeloid leukemia. Phase 3 clinical trials are expected to begin in 2015. T.R. Winston & Company, LLC acted as exclusive placement agent to Tolero. ……….Click here for a free trial to The Health Care M&A Information Source and download the current issue today. The 2014 Hospital Acquisition Report – Free Webcast Offer! There’s no quicker way to get current on the hospital M&A market or review historic hospital M&A data. Learn all about today’s hospital merger and acquisition market, not just what’s covered in major media. Order by August 31st and receive a FREE webcast: Key Growth Sectors in the Health-Care Services M&A Market. 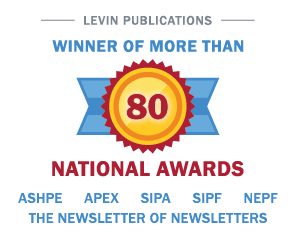 Go to http://www.levinassociates.com/landing/orderhos or call 800-248-1668 to order today. Sign up for a free trial subscription to Health Care M&A News! Be the first to know. Don’t risk missing another day of this week’s biggest health care M&A deals! Sign up here.